A Lucky Ladybug: HAPPY 1 YEAR BIRTHDAY A LUCKY LADYBUG!!! 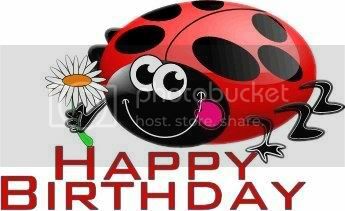 HAPPY 1 YEAR BIRTHDAY A LUCKY LADYBUG!!! So excited to announce A Lucky Ladybug has finally reached it's ONE YEAR BIRTHDAY!!! Come join us in a celebration tonight at 8:30 pm via Facebook for some fun trivia and giveaways!!! happy birthday! love ya Randi! Thanks for all your help! OH and thanks for all the inspiration<3!